This Birds Beige tapestry shows a delightful design of flowers and birds from a Russian painting on wood. Here we see an urn of flowers and fruit on a pedestal flanked by birds on either side. The color palette is beautiful, and uses a close combination of greens and mauves such as in the leaves and flower garland, accompanies by a variety of green foliage and blue ribbons. A lovely beige, gold and crimson border completes the work. 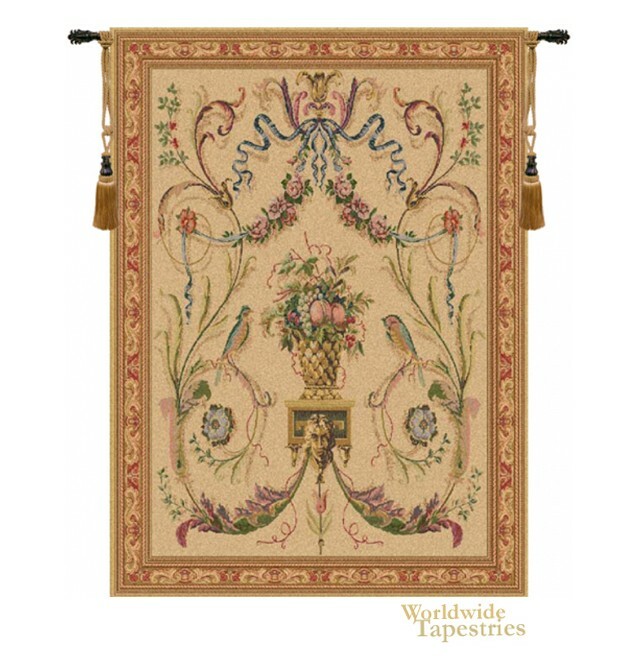 These French styled tapestries utilising natural motifs as a design construction is typical of portiere tapestries used in French palaces to decorate their chambers. This Birds Beige art tapestry is backed with lining and tunnel for easy hanging. Note: tapestry rod and tassels, where pictured, are not included in the price.